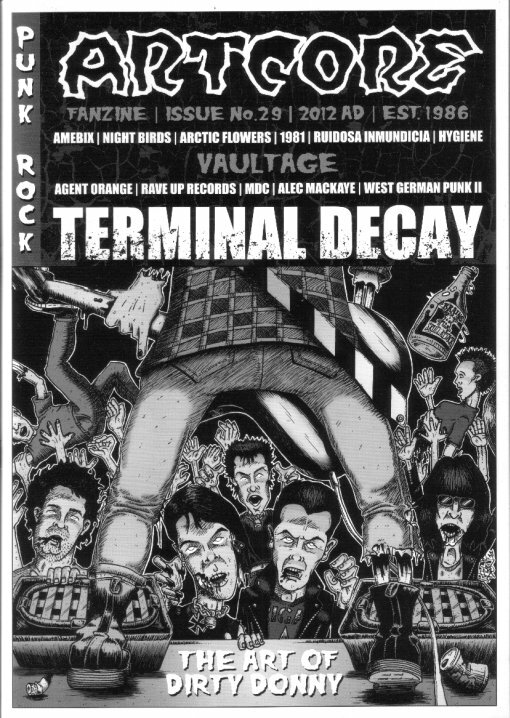 VA – Terminal Decay LP / Artcore Fanzine #29 - Old Punks Never Die! « The Right To Shirk! AKA ‘Artcore Vinyl Fanzine Volume Five’. Punk rock fixture ‘n’ fitting Welly is back with yet another broadside in his war against mediocrity in the zine scene. And he’s a veteran in every sense – this is issue #29 of the exceptional ‘Artcore‘, an organ that he’s been thrusting into the hands of grateful punks since 1986. But with the printed word becoming harder to sell to the internet masses, Welly’s risen to the challenge and occasionally produces a vinyl fanzine to bring something a bit different to the table. Like this one. The mag is as jam-packed as ever and, with Welly’s experienced eye, beautifully laid out. All of the bands on the album are covered within, some with full interviews and the rest with smaller info panels, there are a few dozen quick reviews (I wish I had the ability to be both that brief and informative), a couple of Wellian polemics (the one on ‘knowing your place’ is outstanding), a bit of ranting banter from a few mates, some history lessons (MDC and more German punk), interviews with a range of deviant types (the highlight for me has to be the one with Rob ‘The Baron’ Miller of Amebix), and all tail-ended by some lovely ’50s horror comic style artwork courtesy of Dirty Donny, who also gets to say a few words. 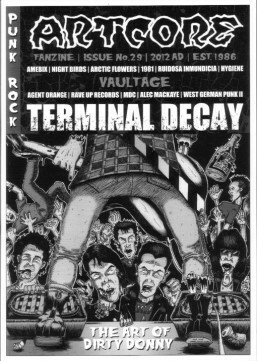 Crammed on to the large round thing that accompanies the mag (AKA ‘Terminal Decay’) are twenty tracks that showcase a load of new(ish) bands from across the punk spectrum who are taking punk forwards on their own terms (whilst respecting the traditions that preceded them). Like any comp, there will almost certainly be a track or two that don’t quite gel with your ears. It’s music, it’s a personal response, that’s what happens. But, to these ears, this one hits the spot far more often than not, and even the ‘worst’ of the tunes is alright. Other great things about the comp are that the bands represent 12 countries between them, thirteen of the tracks are previously unreleased while, for two more, it’s their first vinyl outing. That’s proper old-school, when comp albums would be made up almost exclusively of new songs and / or unknown bands from all over the place. Welly wants to keep this deal as analogue as possible, but has kindly agreed to let me upload the title track (as used in the above video). If you want to hear the rest of it (and you’d be bonkers not to), you’ll have to grab this quick.